List ways Sales Cloud can help improve your lead management. Describe how Sales Cloud can make your sales team more productive. Explain how the Salesforce mobile app can make your team a mobile powerhouse. Now that you’ve learned the signs that you need a CRM, let’s take a look at how Sales Cloud improves your sales processes. Hot leads don’t stay hot for long. They buy from whoever calls first—you or a competitor. Too often reps start with the largest, nearest companies, instead of with the actual hottest leads. There's a reason Sales Cloud is the world's #1 platform for sales: it corrects this problem with smarter ways to rank leads and route them to the best possible rep for healthier pipeline and bookings. If you’re a sales leader, you live and breathe your pipeline. And your reps are (or really should be) accountable for tracking their selling activities. From the time they learn about a lead, until they close the deal, reps can record everything that matters in Sales Cloud. Say, “So long!” to sticky notes and, “Hello!” to a clear view of your deal flow. Sales Cloud makes it easy to track every call, email, and interaction—and task team members to pitch in. Most people agree that Steve Jobs would not advise you to waste time correcting your sales team’s mistakes when you could do things right the first time. 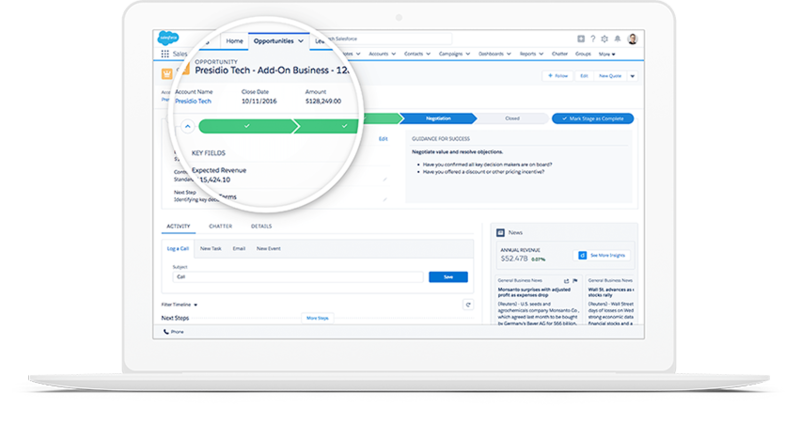 Sales Path lets you add customized guidance to every step of the sales cycle, so your reps execute flawlessly every time. You know that one step your reps are always forgetting? Sales Path makes it impossible to forget. At Salesforce, we require our reps to attach a product to a deal. That way we can bring in the right expertise at the right time. Because key steps like this are built right in, reps don’t have to struggle to think about how best to advance each deal. Sales Path gives them the information they need, at just the right time to move their deals closer to closed-won. Remember the last time you went out without your smartphone? Neither do we—or your reps! Enable the Salesforce mobile app, and you can take advantage of the moments between meetings, elevator rides, bites of your sandwich—the possibilities are endless. The Salesforce mobile app lets you tap into all your Sales Cloud data from a mobile app. With your Salesforce license, your reps can download it free from the Apple app store or Google Play. Seriously, invest the few minutes to install it and you can save oodles of time. Or take it one step further and remove the need for data entry with Inbox—automatically log emails, calendar events, and more. For your sales team to hit their monthly and quarterly targets, they need to make progress every day—the work can't just happen at the end of the selling period. Your sales reps need to start each selling day with a goal and track against that in Sales Cloud. Put all the information reps need front and center with custom home pages, so each person can see their key opportunities, next steps, and dashboards at a glance. After all, there’s nothing like a live scoreboard to motivate each member of your team. 1 minute X the number of times each rep does the task X the number of reps you have = BIG savings! Here are a couple ways Sales Cloud can help reps find more time to sell. By automating your sales process, your reps can skip the busywork and take the right actions at the right time. The really great thing? With Sales Cloud, you can manage workflows and process with point-and-click tools. 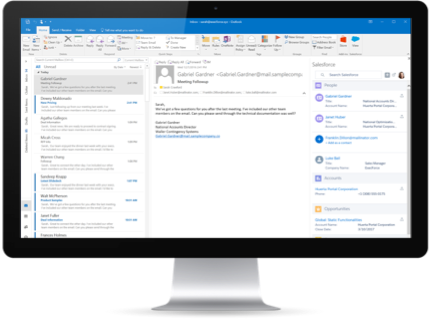 Does your team live in Office 365, Exchange, or Gmail? Connect your email to Salesforce, so reps can update their records effortlessly and send one-to-many messages with one click.